The alpaca wool is a natural fiber harvested from the namesake animal, alpaca. The yarn is soft, durable, silky, and luxurious. It may be thin or thick depending on how it is being span. The yarn looks like that of sheep’s, but is much smoother and warmer without lanolin which makes it hypoallergenic. Repels water and is well tolerated, even in the heat, protects against solar radiation and is hot if it is still wet. Those features enable animals to cope with the changes in weather conditions. The same features are inherited in a garment made from alpaca and offers the same protection to the human body. 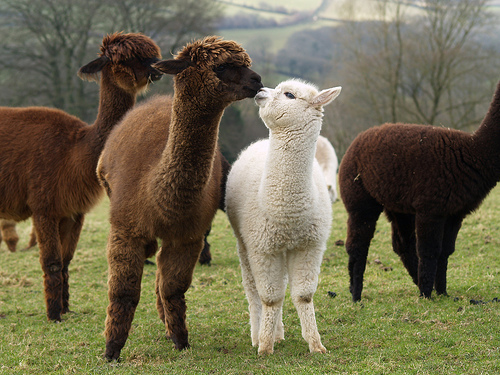 The alpaca comes from the family of camelids. It has been bred by humans since ancient times in the highlands of the Andes, Peru, Argentina, Chile, Bolivia. In recent years we find this breed in America, Australia and New Zealand. With the current knowledge, the breeders can get from each adult animal, about seven pounds fleece annually. Only three pounds of it will be suitable for the quality alpaca fiber. Selecting and separating the finer diameter fibers, like fleece from younger animals, much more soft and silky yarn is been taken, similar to that of merino wool.